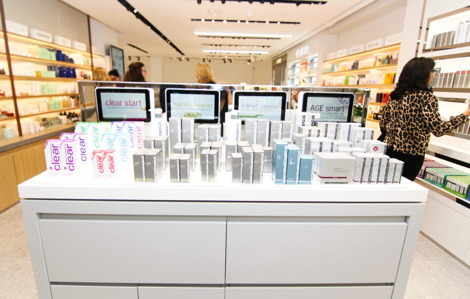 Founded by skin therapist Jane Wurwand, Dermalogica has been revolutionising skincare by shifting the beauty industry’s focus from cosmetics to skin health since 1986 and since 2013 when it opened its first stores to sell direct to the public, it has been doing a pretty good job at redefining what retail can be also – especially with this really nice use of Signagelive  which has been used in four UK locations already – Dermalogica expects the network to be rolled out to across the remaining 23 stores by the end of 2017, Ed. 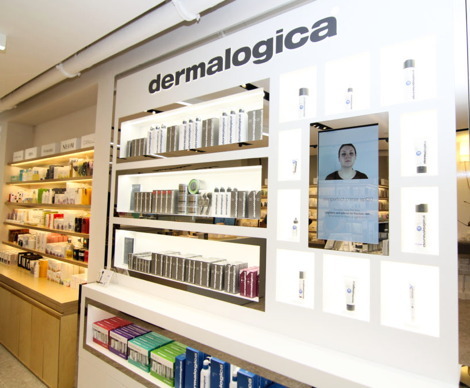 The Dermalogica collection comprises a selection of unique skincare systems which are individually prescribed to each customer for their specific skin concerns using the brand’s ‘Face Mapping’ skin analysis technique. Apart from displaying prescheduled content about Dermalogica skincare products in an eye-catching and engaging manner, the digital signage network is also being used to raise awareness of its ‘Hero’ product range via ‘Lift and Learn’ applications to increase brand loyalty. Carefully chosen items are placed on small sensors (concealed inside retail counters) positioned in front of small, instore displays. If an item is subsequently ‘lifted’, a trigger is activated to display detailed product information about that item on a corresponding display.